One of my favorite shopping trends of recent years is the subscription box. I love looking forward to fun things in my mailbox every month—from snacks, makeup, baby gear, and more. I’m always on the hunt for the newest and most innovative box services, and it seems like there’s a new one popping up almost daily! What I’d never really thought of, though, are goodie boxes from right here in the islands. It turns out there are quite a few services that can send you a monthly box full of Hawaii-made products. Here are a few of our faves! The Aloha Crate is a great deal if you’re constantly dreaming of hard-to-find Hawaii edibles. Locally-made condiments, baked goodies, snacks, and even beverages like tea and coffee make their way into this fun box every month. Whether you’re a former resident who has a hankering for some tastes of home, or if you just want a little burst of Hawaii goodness in your mailbox every month, the Aloha Crate might be perfect for you! Kula Fields HI-Five Box – $39/month – Edibles, body care, housewares, and more! The Kula Fields HI-Five Box comes straight to you from beautiful, upcountry Maui. It’s a bit pricier, yes, but it garners you five full-size locally-made products per month. They work with local artists and artisans, who offer hand-made products for each month’s box. While other services offer products from larger, more mainstream Hawaii companies, Kula Fields’ HI-Five Box takes care to include only artisan products, made with aloha. It’s a great deal, considering the quality of the products, and how expensive it would be to ship each individually! The Tiki Box – $15/month – Snacks, snacks, and snacks! If I ever move away from Hawaii, my first order of business will be to subscribe to The Tiki Box. If you like to try new snacks, then I’d recommend giving this one a try immediately. Rather than the usual three-to-five items that you get from most subscription boxes, this one is packed with sample-sized goodies galore. Included are snacks that are made in Hawaii (like chocolate macadamia nuts, li hing mui, and Kona coffee cookies), and also made-elsewhere goodies that Hawaii just can’t get enough of (like Japanese rice crackers, Chinese candies, and other Asian favorites). Some of these treats might not be what you’d immediately think of when you think Hawaii, but for Hawaii locals, this box is a taste of home! My Aloha Post is another trendsetting subscription box, and their team puts together a simply gorgeous box. They take care to include a little of everything in each one—a nibble, a beauty item, some stationery or housewares—you get the idea. 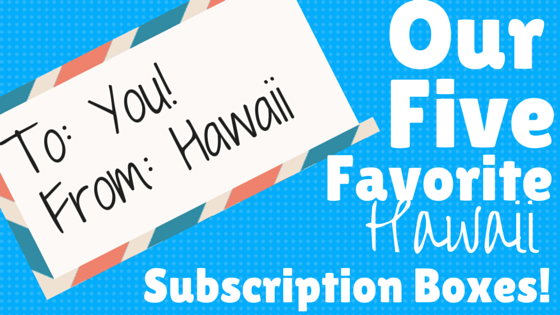 They take their inspiration from different themes each month, so you’ll be sure to get a cohesive, carefully-curated box of Hawaii-made products each month. Most of all, there’s a spirit of fun and whimsy to each one, sure to put a smile on your face even if you’re miles away from the sandy shores of Hawaii. My Aloha Post also takes care to support upcoming artists and small businesses, so they’re making an even bigger impact on Hawaii’s community! Imagine your perfect day on the Road to Hana. Does it include leisurely dips in a fresh pool under a beautiful, natural waterfall? Plenty of time to explore, and a new experience around each hairpin turn of the road? A peaceful, relaxed day, spent up close and personal with the natural, outdoor beauty of East Maui? If so, we’d love for you to join us on the Hana Picnic tour, which offers the most time at different sights, and the most leisurely and relaxed pace for those of you who just want to get out, explore, and enjoy. Your day starts right around 7:00 AM, where your Tour Guide will be at the front door of your hotel, condo, resort, or residence. Hop into our luxury Limo-Van, settle into your personal leather captain’s chair, and be ready for a day of fun and adventure along the Hana Coast. 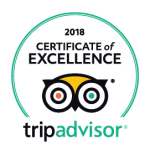 Your group will consist of up to eight like-minded, discerning travelers, and your Hawaii Certified Tour Guide, who will provide full narration at every turn. The first stop on this tour is Ho’okipa Beach Park. Here, you’ll feel the incredible energy of the waves crashing against the sandy shoreline, and have time to get some beautiful morning photos of this world-famous windsurfing beach. Enjoy a morning pastry and some coffee, tea, or cocoa as you chat with your Tour Guide and fellow travelers—and maybe even see some lounging sea turtles or a Hawaiian monk seal on the sand! “Ho’okipa” means “welcome,” and you’ll get that welcoming feeling here first-hand from your Tour Guide as excitement builds for the rest of the day. Next, it’s time to hit the road. You’ll learn about the history of the renowned Hana Highway, along with fascinating facts about local plant and animal life, both ancient and modern Hawaiian culture, and the geology of our island itself. At Kaumahina State Park, get a first-hand look of endemic plants, and enjoy beautiful views of the breathtaking coastline that lies ahead. 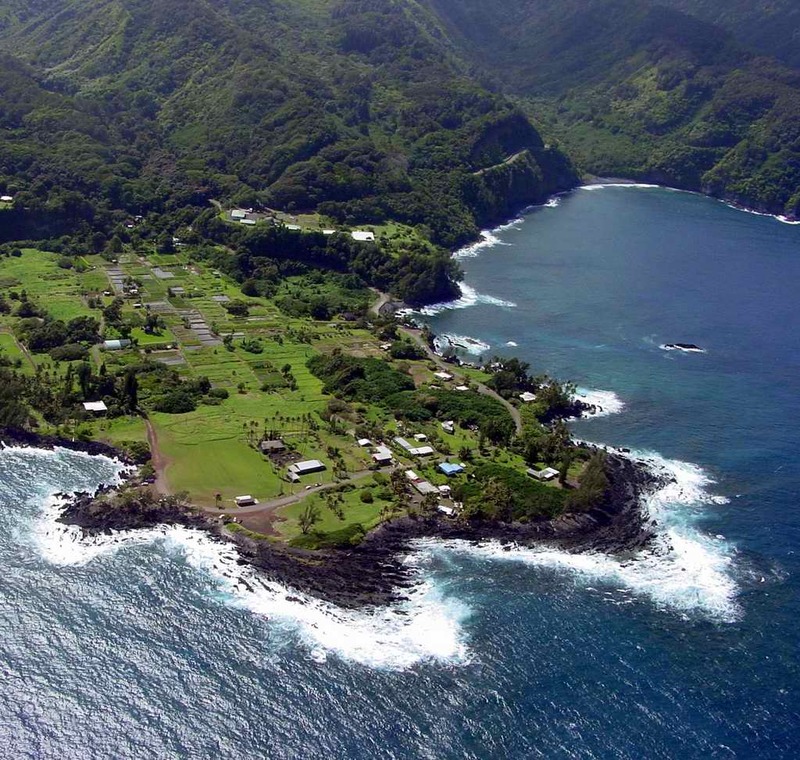 Simple and secluded, the lush village of Ke’anae feels like a different world. Then it’s on to Ke’anae Peninsula, which is home to a quiet Hawaiian village that still holds to many old Hawaiian traditions. You’ll see traditional taro patches (lo’i), and small, unassuming homes along this beautiful, oceanside town. 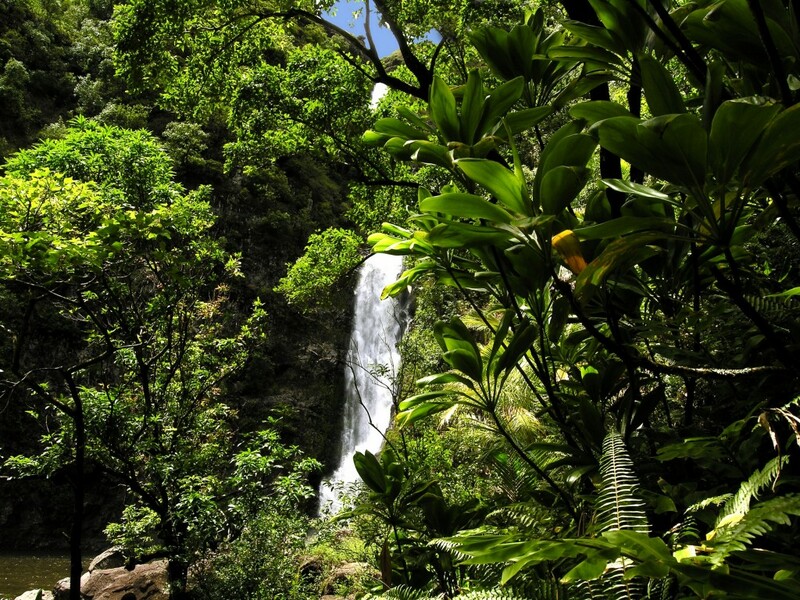 After Ke’anae, you’ll continue on to Pua’a Ka’a State Park, where you can enjoy a secluded stroll among natural, lush foliage, and, if you choose, a refreshing swim in a natural pool under a flowing waterfall. Almost more flowing waterfalls than you can count await you on the Road to Hana. After Pua’a Ka’a, your Tour Guide will take you around even more turns and over one-lane bridges into Hana, with stops along the way for photos and exploration. Once you’re in Hana, you’ll truly feel the Aloha Spirit in this little town where colors just seem to be a bit brighter, and the air is just a bit more refreshing. After learning about some of the interesting spots in town and its unique history, your tour will make its way to laid-back and beautiful Hana Bay. Here, you’ll enjoy sunshine, refreshing sea air, and a Pacific Rim cuisine picnic lunch, complete with hearty wraps, garden vegetable past salad, chilled pineapple, and macadamia nut brownies. Before making your way back into town, your Tour Guide will take your group to Waianapanapa State Park, where the sapphire blue ocean, emerald green foliage, and jet-black sand and lava rocks make for a gorgeous view, and will be some of your most treasured photos of your time in Maui. Here, you’ll have a chance to venture down to the famous black-sand beach and dip your toes in the sparkling clear waters of the Pacific Ocean. 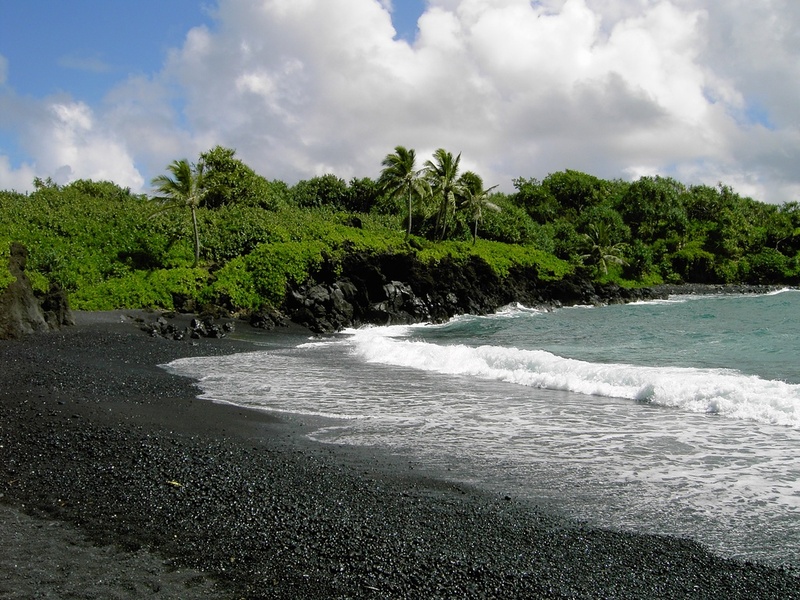 You’ll find the deep, dark, jet-black sand of your dreams at Waianapanapa. On your way back to your hotel, we’ll go at the same relaxed, laid-back pace that truly sums up the Hana Picnic experience. Roadside fruit and banana bread stands, more photo opportunities, and anything that you may have missed on the way to Hana can be enjoyed on the leisurely drive home. As you say your goodbyes to your group and your Tour Guide back at your hotel, you’ll be ready to reminisce, sort through photos, and just continue to enjoy that relaxed, luxury vibe that encompasses our Hana Picnic tour. If this tour sounds like your idea of an adventure in paradise, let us know, and we’ll be thrilled to make it happen! One of the must-buy mementos for a lot of folks visiting Hawaii is the Aloha shirt—and why not? It’s a wearable piece of the Islands, and it’s perfect to wear around the resort, at happy hour, and anytime you’re just digging your toes in the sand. You probably don’t even get it out of the closet again until it’s time for another Hawaiian vacation, but here in Hawaii, the Aloha shirt is a staple item, especially for men. Whether you’re at the bank, an insurance office, or even in a court of law, you’re bound to see the ubiquitous Hawaiian shirt as business attire almost everywhere. Why is that, though? The Aloha shirt has its roots in ancient Hawaii, from hand-made kapa cloth, dyed with intricate patterns. Additionally, the Tahitian pareu, cloth printed with simple, bold floral patterns, had a hand in making Aloha attire what it is today. Later, as Filipino workers started to settle in the islands, the untucked style of their barong tagalog shirts made its way to the Aloha shirt as well. 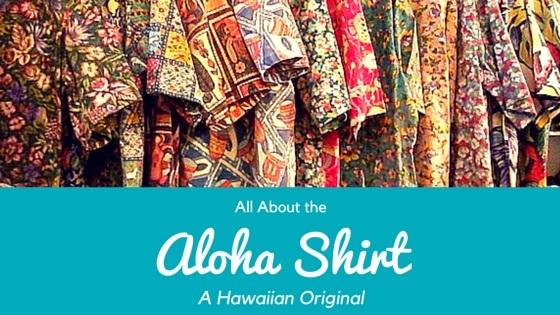 The first Aloha shirt dubbed as such was sold in 1935, by a tailor in Honolulu. These shirts were aimed at tourists, as they could be made quickly, and worn throughout a stay in Hawaii. They were, however, instantly popular with tourists, surfers, and locals alike. By the fifties, as travel to Hawaii became easier and more affordable, Aloha shirts flooded the market. Many were seen as simply a tacky souvenir, many designers started to elevate the garment, using higher-quality material and more interesting designs. Some of those early brands that are still around today are well-known labels like Tori Richard and Reyn Spooner. By the sixties, the Aloha shirt was on-trend for men all over Hawaii. To encourage this Hawaii-centric style, and to support local garment industries, many businesses (including the Hawaii State Senate) encouraged men to wear their Aloha shirts to work on Fridays. The result? The Aloha Friday tradition continues today (watch news anchors trade their suits for Aloha shirts and lei on Fridays!) and it even made its way to the US Mainland. Does your company have Casual Friday? You have Hawaii to thank for that! Today, Aloha shirts can be found everywhere, and in styles ranging from the most bright and colorful to the muted, “inside-out” prints that businessmen tend to prefer. There is almost never an occasion where an Aloha shirt isn’t appropriate in Hawaii—even most funerals ask that attendees don “Aloha attire.” From architects to college professors, the Aloha shirt is just another laid-back, comfortable, breezy part of life in Hawaii. With our four different Road to Hana tours, sometimes it can be a difficult choice for those wishing to make the world-famous journey. 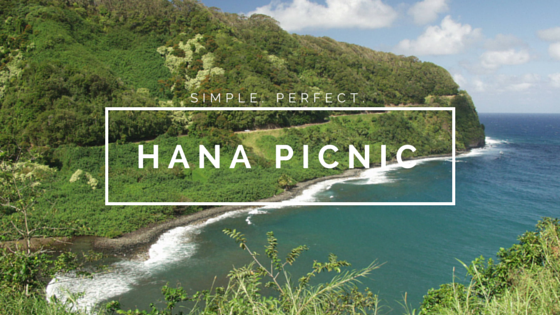 Those wanting a relaxing, laid-back day with plenty of time to swim and relax might go for the Hana Picnic. Visitors who really want the full “luxury” experience will love the Hana Ultimate. Guests who want the most out of their tour (and to have time in the day for another adventure) might pick the Hana Sky-Trek tour. But what about those extra-adventurous folks, who are looking for something a little different out of their Road to Hana tour? If that sounds like you, then you might be up for one of our favorite tours—the Hana Cave-Quest! 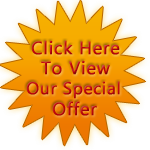 Like all our tours (except the Hana Sky-Trek), this tour starts right at your hotel, resort, condo, harbor, or residence. You’ll be traveling with a group of six to eight like-minded, adventurous individuals, and your Hawaii Certified Tour Guide. After a light morning snack, served with coffee, tea, cocoa, water, or a tropical soft drink, you’ll be on your way to Hana. Your group will enjoy multiple stops along the way, including Keanae Peninsula, Pua’a Ka’a State Park (waterfall swim, anyone? ), and may other photo-op stops along the way. The main event for this tour? The Ka’eleku Caverns, located near the Hana Airport. Your Hawaii Certified Tour Guide will guide you into the caverns, which were formed thousands of years ago by a major lava flow. As lava on the surface cooled, it created an insulated “tube” for lava to continue flowing underground. During your walk through one of Maui’s most amazing natural wonders, you’ll see stalagmites, stalactites, and huge formations that appear to have been formed from chocolate. Your Tour Guide will point out the major points of interest, and you can peruse the signs lining the walkway as well with a flashlight provided by the caverns. The entire tour is about a third of a mile, and you’ll get to experience complete darkness at the end, as everyone flicks off their flashlights. After your underground tour of the caves, you’ll enjoy a picnic lunch on the lovely grounds, and you can even check out a red ti-leaf maze while you’re there. After lunch, you’ll head farther into Hana Town, tour a tropical flower farm, and visit and view the famous black-sand beach! We’ll make our way back from Hana the way we came in, again, making multiple stops along the road. You’ll return to your hotel at approximately 5:00 PM, and you’ll enjoy memories of one of the most unique activities on Maui for years to come! 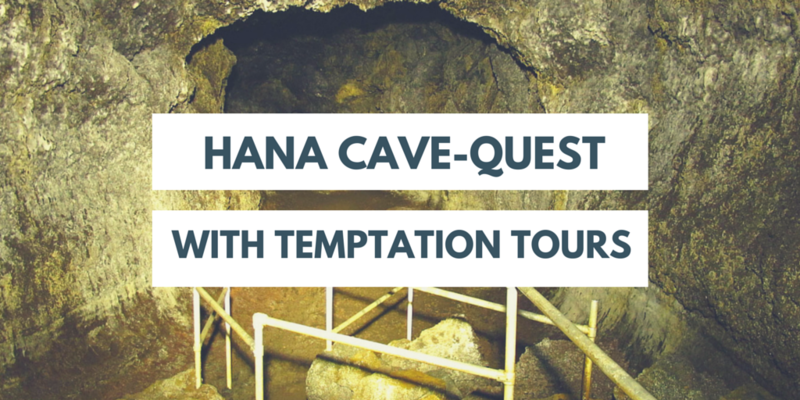 Check out our Hana Cave-Quest video below! I’m sure you’ve come across the all-important kukui nut before. Whether you’ve bought a few of those stylish kukui lei, or you quickly Googled “kukui oil” when Lupita Nyong’o mentioned it as one of her skin-care secrets, the amazing kukui nut has certainly crossed your radar. But apart from making trendy cosmetics and long-lasting lei, the kukui nut has uses you may not know of! Kukui is a “canoe plant,” a Polynesian-introduced plant brought to Hawaii in canoes by its very first Polynesian settlers. Like all canoe plants, this impressive tree had to have many uses for the first Hawaiians. Here are just a few of them! Green, fleshy fruit surrounds the kukui nut and its oily kernel. 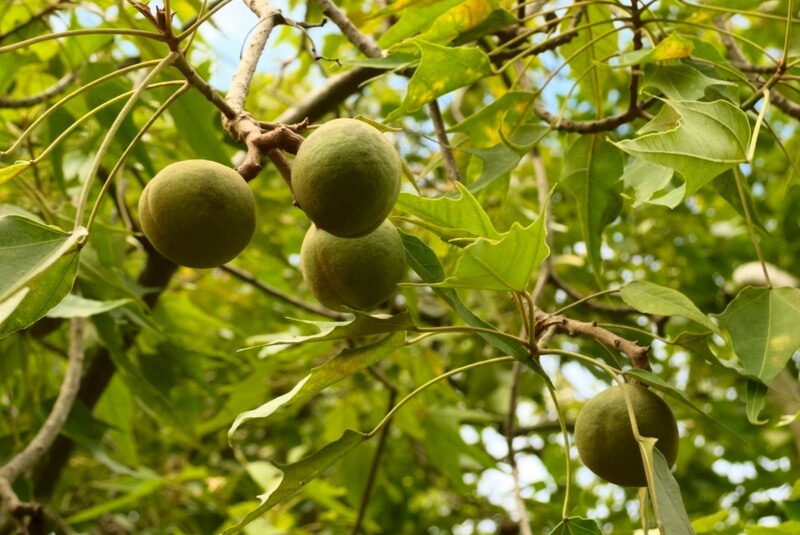 The English word for kukui is the “candlenut” tree, which gives you a clue as to one of its main uses. The oil that the kukui kernel produces is plentiful, and highly flammable. One of the most common ways that Ancient Hawaiians utilized this benefit was by stringing several nuts on a coconut palm rib. Then, the kukui nuts were lit, one by one, from top to bottom. This was also a rather reliable way to mark passage of time. The kukui oil was also used in other lighting applications, like ti-sheath torches. The medicinal uses for Kukui are virtually countless. When roasted, salted, and crushed, the seeds make a delicious condiment known as inamona, which you can find on traditional Hawaiian poke—and it’s used quite sparingly in that application. When eaten in larger doses, though, inamona acts as a potent laxative, and was used as such by ancient Hawaiians. The sap, which is found when the stem is broken off of the green flesh surrounding the nut, was used to treat chapped lips, cold sores, and other mouth sores and thrush in children. 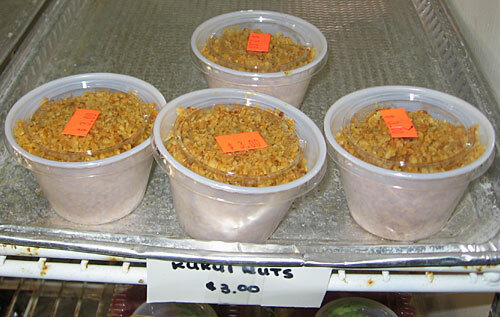 Roasted, mashed kukui nuts, and kukui leaves, were used as a topical cure for rheumatic joints or deep bruises as well. Use restraint when topping your poke with tasty, nutty inamona. It wasn’t just the nuts and leaves that were utilized; like virtually all canoe plants, every part was useful to the Hawaiians. The bark of the kukui tree made an excellent reddish-brown dye for kapa cloth and cordage. Back to the nuts, after burning, their ashes were used to make a rich, black dye for both tattooing and painting canoes (often made of kukui wood themselves) and kapa cloth. When you pick up a beautiful lei, made of polished kukui shells, or decide to try out the latest kukui-oil cosmetic product, remember how useful this special little nut was—and still is—to many Hawaiian people throughout history. Ask your Tour Guide to point out its silvery-green leaves along the Road to Hana, or show you the nuts fallen on the rainforest floor. Canoe plants had to be useful in many different ways to be brought to Hawaii by its ancient settlers, and it’s easy to see why kukui made the cut!